Johannes Kepler was a mathematician, astronomer and astrologer who developed the famous three laws of planetary motion; his first two laws were published in 1609 and his third law in 1618. Collectivelty, these three laws of planetary motion have today become one of the several most notable and lasting legacy of 17th century science and astronomy. In 1609, while Galileo was just learning the details of the newly invented telescope, Kepler had progressed and expanded upon the theoretical and methodical research work of two prominent scientific thinkers: Polish astronomer and mathematician Nicolaus Copernicus (1473-1543) and the Prince of Astronomers, Tycho Brahe (1546-1601). Kepler's three laws were, in part, a result of Tycho Brahe's own life's work and took the form of very percise astornomical data on a large group of starswhile an assistant for Tycho, he had been assigned the task of analyzing the data of planetary observations and in particular, that of the planet Marswhich Kepler had "liberated" upon the death of Brahe in 1601. His research culminated in the 1609 publication of a book entitled Astronomia nova or New Astronomy, and contained his first two laws of planetary motion. Kepler's Astronomia nova also modified Copernicus' own theories that had been published sixty years earlier under the title De revolutionibus orbium coelestium or On the Revolution of the Heavenly Spheres. At the heart of Copernicus' De revolutionibus was his own belief in a sun-centered or heliocentric solar system, a theory contrary to the accepted belief in a earth-centered universe or geocentric system, which had held sway since the days of Aristotle and Ptolemy and had become, by the 17th century, dogmatic teaching. Image above left is a Portrait of Nicholas Copernicus (14731543). In addition, Kepler made other lasting contributions within various other areas of science and astronomy that included a systematic study of a newly discovered star (this was actually a supernova, today known as SN 1604), which he published in a work entitled De Stella Nova; research work conducted in optical theory and an analysis on the working of the human eye, published in a 1604 manuscript entitled Astronomiae Pars Optica or The Optical Part of Astronomy, gaining recognition as the foundation of modern optics; described his theoretical, experimental investigations and improvements on the optical properties of telescopes which appeared in the 1611 Dioptrice and published Tycho Brahe's accurate data on the positions of stars and planets which were of immense value to navigators. Image at right, Tycho Brahe courtesy H. Heintzmann. ...who had devoted himself passionately to the pursuit of deep insight into the nature of natural incidents, and who, despite all inner and outer difficulties also reached his high aim.  Albert Einstein in a pre-text of a book about Johannes Kepler from Short life history: Johannes Kepler. The University of Tübingen is located in the Baden-Württemberg region of Germany and is one of the oldest universities in the country, having been founded in 1477 by Count Eberhard V. It is internationally noted in medicine, natural sciences and the humanities and has been consistently ranked first amongst all German universities for many years. It was also the university that Johannes Kepler entered in the year 1589; the same that fellow German Wilhelm Schickard would also attend and graduate from. Schinckard was a polymath and desinger of an improved calculating machine based on the Napier's Bones or Rods model, and one of Kepler's younger contemporaries with whom he would later correspond with regarding the benefits and use of Schinckard's invention in calculating astronomical tables. 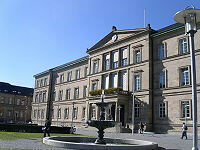 Image above left is the University's Neue Aula courtesy Wikipedia. So it was, that in September of 1589, Kepler put behind his hard lean days and entered the University of Tübingen, where events over the next five years would change both his way of thinking and career. In the meantime, Kepler had the good fortune to study geometry and trigonometry under Michael Maestlin, the professor of mathematics at Tübingen and one of Europe's most highly regarded astronomers. For his part, Maestlin came to view Kepler as one of his most able of mathematical students, one that would go far and for Kepler, "far" would begin in 1594, but not before Michael Maestlin would arm Johannes Kepler with a concept that would turn into his life's work: the universe according to Polish churchman Nicolaus Copernicus. Image left of Michael Maestlin courtesy Scientific Identity: Portraits from the Dibner Library of the History of Science and Technology. 1. The date of his father's disappearance has been placed at vaious times: 1576, 1587 & 1589. Research indicates that he was still around in the mid 1580's, trying to make a living as a proprietor of a Tavern and left only after it's failure, disappearing entirely from the historical record at the close of the decade. See reference  below, Johannes Kepler And Planetary Motion p.7. 2. During the period from 1577-1580 there were numerous eclispes recorded by Tycho at Hven: two total lunar eclispes on April 2 & September 27 of 1577; one total lunar eclispe on September 16, 1578; a partial solar eclispe in February of 1579; one total lunar eclispe on January 31, 1580. He also followed and recorded the comet of Octorber 10, 1580. Barker and Goldstein, Theological Foundations of Kepler's Astronomy, pp. 11213. © 2001 The University of Chicago Press. Baumgardt, Carola Johannes Kepler: Life and Letters, Gollancz, London 1952. See also: New York: Philosophical Library, 1951 UCSC S & E Lib QB36 K4 A3. Excerpts from Kepler's letters in English with an Introduction by Albert Einstein. Wilson, John Wm. Johannes Kepler (1571-1630), 20 November 2001, Department of Physics and Astronomy, Georgia State University. This is a downloadable file in .doc format. Knight, David C. Johannes Kepler And Planetary Motion (1962) p.10 , Publisher & Copyrightowner - Franklin Watts, Inc. Library of Congress Catalog Card Number: 6210380. This is a interactive flip book with a compatible text version located on this page Access and electronic publication formats made available through the excellent efforts of the Internet Archive. Rottman, Gerald Dr. The Geometry of Light, Galileo's Telescope Kepler's Optics. Published December 30, 2008, pgs.118. This is an online e-book which "...provides readers access to pioneering ideas about light, vision, and the telescope as they appear in Johannes Kepler's book Dioptrice." Nicolaus Copernicus (1473-1543) De revolutionibus orbium caelestium. 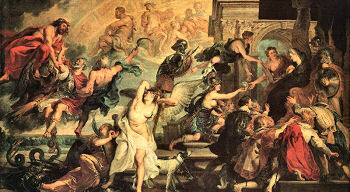 Origins of Modernity, Cosmology & Astronomy, Basileae: Ex officina Henricpetrina, . Radio Prague Danish researchers hope to solve 400-year-old "murder mystery", 04-02-2009 16:19, Jan Richter. "Fame, envy, intrigue and murderthat is what some suspect surrounded the mysterious death of Tycho Brahe..."
Unless otherwise stated, all images, screen shots, electronic materials including instructional, software, scripts and web pages referred to herein or incorporated by reference are copyrighted © by A Universe in Time. None of the content herein may be reproduced or copied in any manner from this website without the prior written permission of above indicated copyright holder(s). All images and orginal works of the author(s) used within the above or foregoing web pages are for the sole purpose of information and display at A Universe in Time website and have been used with the kind permission of the respective owner(s).